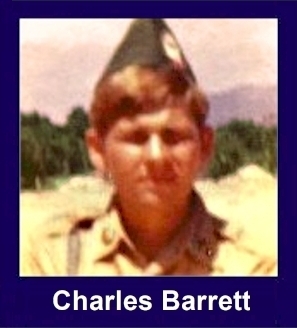 The 35th Infantry Regiment Association salutes our fallen brother, SP4 Charles Wesley Barrett, who died in the service of his country on March 12th, 1967 in Kontum Province, Vietnam. The cause of death was listed as Small Arms/AW. At the time of his death Charles was 20 years of age. He was from San Francisco, California. Charles is honored on the Vietnam Veterans Memorial at Panel 16E, Line 68. The decorations earned by SP4 Charles Wesley Barrett include: the Combat Infantryman Badge, the Silver Star, the Bronze Star, the Purple Heart, the National Defense Service Medal, the Vietnam Service Medal, the Vietnam Campaign Medal and the Vietnam Cross of Gallantry with Palm Unit Citation. For gallantry in action against a hostile force: Specialist Four Barrett distinguished himself by exceptionally heroic actions while serving as a Fire Team Leader in the 3rd Platoon of Company B, 2/35th Infantry, while conducting a search and destroy mission, in the Republic of Vietnam. On 12 March 1967, the company was moved by helicopter into a landing zone and began to advance over hilly terrain covered by dense underbrush. Contact was made with an enemy force of undetermined size, armed with small arms and automatic weapons. In the initial moments of the engagement, Specialist Four Barrett reacted with decisive and positive action. He quickly deployed his men, effectively controlling their movement and successfully directing their fire against the enemy. In a determined effort to neutralize the machine guns, which were devastating to the company, Specialist Four Barrett charged forward with complete disregard for his own safety, while exposing himself to the intense hostile fire. He closed in on the enemy positions and placed successive and accurate fire upon them. During his fierce assault, he was mortally wounded. His supreme valor inspired all who observed him, and his self-sacrificing actions spurred his fellow soldiers to rally and ultimately seize the objective. Specialist Four Barrett's outstanding display of personal gallantry, devotion to duty, and unrelenting aggressiveness is in keeping with the highest traditions of the military service and reflects great credit upon himself, his unit, and the United States Army.